Co-working spaces are becoming more and more prevalent around Hong Kong. They have the same facilities as a traditional office, allowing people to concentrate on their work efficiently, and a range of luxurious amenities designed to make people feel comfortable and relaxed. More importantly, these spaces encourage people to interact and network with other professionals from numerous industries, creating a dynamic, close-knit community that constantly inspires innovation. While co-working spaces may constantly be associated with startup companies, they are suitable for anyone looking for a place to work. The Executive Centre’s prestigious locations in the heart of Hong Kong’s business district offer members an executive experience. The enviable contemporary interior design in all of their offices resemble offices straight out of television series like Suits. Not only does the Executive Centre allow members to network with other professionals within the co-working environment, members are also connected to a global community of professionals from The Executive Centre’s international locations in 30 different cities, including Beijing, Dubai, and Sydney. The Work Project brings the office lifestyle to the next level. Located conveniently in Causeway Bay, an online system of booking enables members to access the workspace during the day or night. Members can book for a space immediately or anytime up to two months in advanced. The architecture of the co-working space is spacious and beautifully designed. Matching the stylish architecture, the Work Project offers a range of luxurious amenities including a gourmet pantry, happy hours, and housekeeping services. The Work Project is also partnered with many restaurants, gyms, and hotels, offering their members partnership access to these services. Members are also invited to network with one another in professional and lifestyle events. As suggested by their name, Playground.Work lives by the motto “work hard, play hard”. With a bouldering wall, football game machine, arcade games, and showers within the facilities, members can easily take a break from work and let loose. On top of these amenities, Playground.Work encourage socialising and networking by hosting engaging workshops and activities such as hikes, film festivals, and nights out to celebrate festivals such as St. Patrick’s Day for members to get to know one another and develop a strong sense of community. Playground.Work takes work just as seriously. The workspace has a designated quiet room for members to concentrate on their work without distraction and a cafe for those who need a caffeine boost. Located within a 5-star luxury hotel on the picturesque Kowloon waterfront, Kafnu revitalises the idea of a co-working space. In addition to the standard requirements needed for a co-working space, Kafnu provides members access to opulent amenities such as video and board games, daily happy hours, on-demand meal delivery from gourmet food halls and Kerry Hotel’s fitness centre, jacuzzi and infinity pool to relax and network with other members. Kafnu also provides enrichment events and office hours with experts designed to help members consider new perspectives, creating a lively community that embodies Kafnu’s vision of creating a living ecosystem. Desk One’s co-working space emphasizes on promoting collaboration between members by organising workshops allowing members to share knowledge and ideas to inspire one another. The collaborative energy found in Desk One extends to their fun ice-breaker workshops and events, which encourages members to mingle with one another while doing an activities such as learning German together. 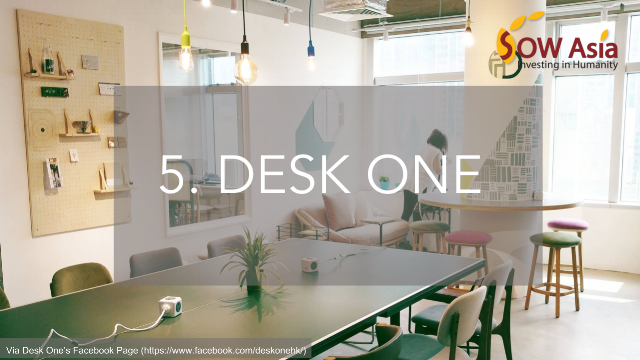 Desk One is not only suitable for startup businesses and freelancers, it is also the perfect study environment for students to do practise mock exams and form study groups. Pricing is extremely flexible, from every 30 minutes to monthly, so members can pay only exactly what they need. Located within Desk One are also a library and a coffee shop for members to take a break from work if needed. Ooosh advertises itself as a co-working space targeting start-up operations. The co-working space prides itself in providing opportunities for members to network with fellow startup companies from a range of different industries, such as entrepreneurs, web/app developers, and digital marketers. To promote networking, events such as monthly lunch gatherings allow members to socialise with one another and form a strong community. Ooosh also facilitates the development of start-up companies by offering help in legal drafting, accounting, public relations, marketing, design, and production. For those who don’t subscribe to the traditional 9-5 office hours, Ooosh is open 24 hours a day, allowing members to access the facilities whenever they need. Metro Workshop is a modern loft-like co-working space in the centre of the industrial area of Kwai Chung. Members could access the workspace 24 hours a day if needed, which is ideal for working long or untraditional hours. For those in the creative industry, there is also a production studio with equipment and technical staff on hand for photo, video, and product shooting needs. Members are also encouraged to network in events hosted by the workshop, including offering free legal consultation and business talks, where attendees can mingle and connect. K-Town Hub (Shatin) is the perfect space for start-up companies looking for a co-working area to move their business forward. The co-working space offers co-back office services, which helps their clients with managing administrative affairs, including taxation, accounting, and bookkeeping. Clients could also request secretarial services provided by a member of the K-Town Hub team to ensure clerical duties are performed efficiently without taking away focus from the business. Moreover, their co-creation services foster business development by working with their customers to design and develop websites, social media, and branding to maximise their marketing potential. The Hive is located in the charming town of Sai Kung, away from the hustle and bustle of the city, only a few minutes away from the ocean and mountains. The beautiful serene environment, large working space, and attractive amenities, such as the coffee lounge, encourages productivity. Members of the Hive also have access to the Hive Network, a community that spans all across Asia in cities such as Bangkok, Singapore, and Saigon, and are able to network with other members from various industries and professions. For young entrepreneurs below the age of 23, early stage companies, and start-ups, the Hive offers a special reduced rate to encourage innovation.